Available today, our updated mobile app for iOS brings an unprecedented level of workout analysis to your iPhone or iPad. I’m very proud of the work our mobile team has done and thought I’d take some time to show off our new bells and whistles. To answer the obvious question from Android users, we are hard at work bringing this same amazing functionality to the Android market. Lets dive-in and take a look at some of the killer features. To begin reviewing your data, tap on any workout in your activity feed to see the summary view of the workout. You’ll notice two new icons across the top. 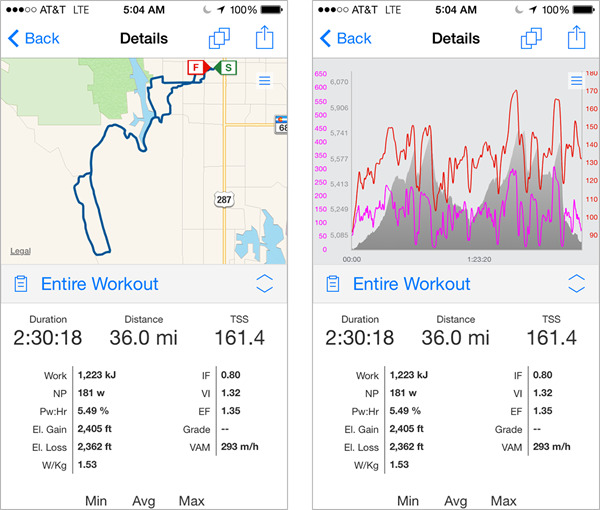 The first will take you to the Map & Graph, the second will show Workout Reports. Let’s start with the Map & Graph. After tapping the icon you will be taken to the Details screen. Here you can view the detailed stats as well as the map and graph. The View Switcher icon at the top allows you to toggle the view from map, to graph or both. You can slide the gripper bar up or down to further customize your view. The stats title bar displays the name of the current selection. Tapping the title allows you select a new segment. You can choose between the entire workout, laps or peak heart rate, power, speed, pace, distance and cadence values. The gripper on the right will allow you move the stats up, down, or out of the way to see all your stats at once or to see an unobstructed view of your map and graph. One of my favorite features is the ability to highlight a custom range on the graph. 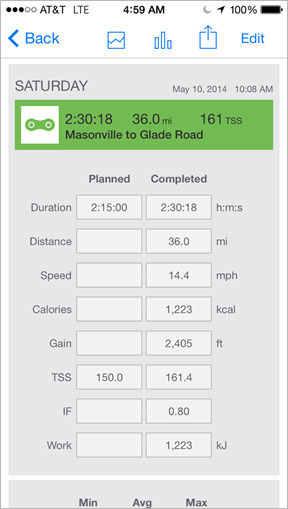 Using a long press and drag, you can select any hill or segment to see the stats from that effort. Once you have reviewed everything you want in the Map & Graph, click on the Workout Reports icon to see the reports for that workout. 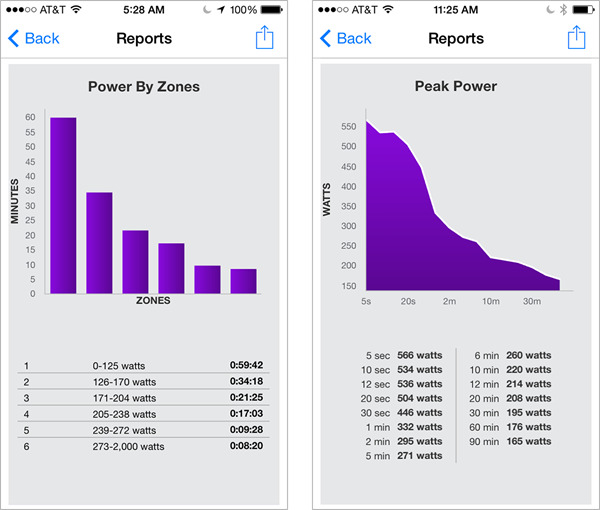 Here you can view reports based on time in zones for heart rate, power, speed and pace. 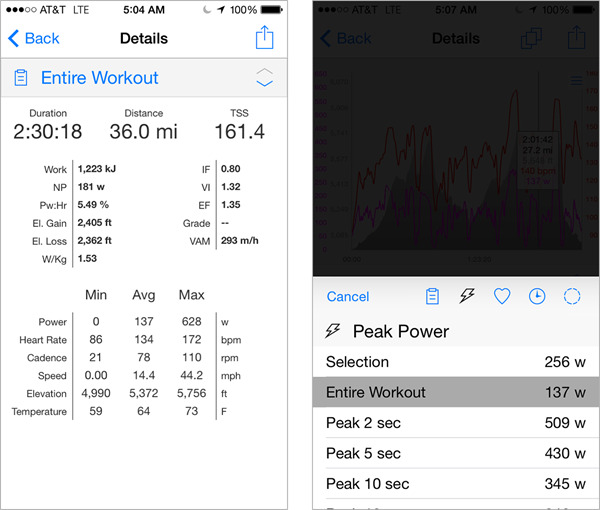 You can also view your peak curves for those same metrics as well as distance and cadence. All of these features work in landscape mode and on your iPad making your workout data more accessible and easy to use. 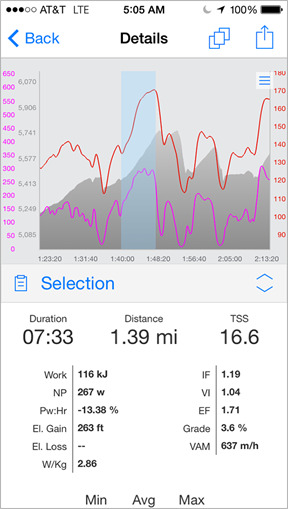 With our improved, high-performance native mobile apps we continue to demonstrate to coaches and athletes our commitment to build the world’s best tools to help you track, analyze and plan your training and racing. Our ecosystem of web, mobile and desktop apps provide an unequalled advantage to coaches and athletes serious about training for an event. I believe deeply that connected apps for mobile and desktop provide the best user experience possible, while our beautiful new HTML5 web app provides the all-access platform available from a browser. 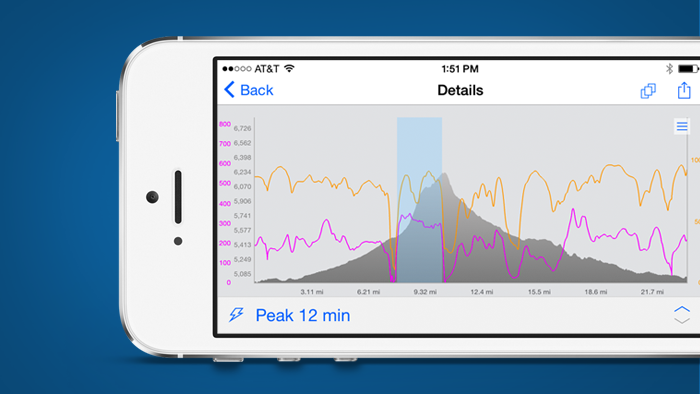 Our mobile app is the most feature-packed workout analysis app on the market. It’s intuitive design, speed and flexibility is unmatched. If you’re looking to dive-in or just want the satisfaction knowing you’re getting the most out of your training, look no further.